Three months ago, I stepped on the scale to weigh myself...and I weighed more than when I was pregnant with either one of our children. It's one part age and a slowing metabolism, and one part poor nutrition. I have developed some terrible habits while I was depressed in the last year: drinking soda, eating out more frequently (minimum of 3-4 times a week), eating meals while watching TV or looking at my phone, exercising less and eating larger portions, and less-than-stellar food choices (candy bars, frequent high-calorie coffee drinks, minimal fruits and vegetables, white flour and tons of processed food). These poor habits crept in slowly, and started a spiral of starving myself during the day in an effort to lose weight...only to hit a blood sugar crash and sabotage my efforts by eating the house down, while I was preparing dinner. And then I'd eat dinner. 1. No processed foods, and I eat only food that I prepared myself. 2. Drink 64oz of water before consuming any other beverages. 3. No refined sugar or processed flour, and limit my starch intake to two slices daily of high protein, high fiber bread or whole wheat rounds. 4. Tons of veggies and variety of fruits. Berries are the preferred fruit for their positive metabolic effect. 5. One serving of cheese and nutmeat a daily. 6. Weigh myself once weekly, right after awakening and using the restroom. I've lost about 12 pounds so far. I've had to tweak my diet a half dozen times throughout my lifetime, and went through something similar about 8 years ago. When I made many of the same changes as above, the weight came off quickly. The fact that it's taking longer both frustrates me and confirms my resolve; no high-calorie dessert is worth the amount of hassle it takes to burn off. While I think the expression 'feeling fit is better than any food tastes' is trite...because OHMYGOD CUPCAKES, the sentiment is certainly accurate. Steel cut oats take over a half hour to prepare, which is precisely the reason this powerhouse breakfast keeps me full and satisfied longer. 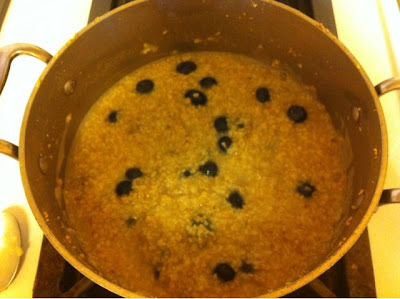 I add a tablespoon of coconut oil at the beginning of cooking to keep it from sticking and add a nice, nutty flavor, and throw in blueberries right before the oats are done. If I include a poached egg, I'm good to go all morning. The key is to have healthy food stocked in our kitchen, and to plan accordingly and pack snacks or my lunch ahead of time for busy days. Hopefully these changes will affect my kids in a positive way. For now, it's a source of stress for Boydoll, who would happily consume the cheese food group only: grilled cheese, pizza, cheese burgers and quesadillas. I'm trying not to sweat it; he can make himself PB&J if his palate can't handle the food we're having, but only after he's given it a chance and tried what we're having. The biggest drawback to my new diet and preparing all my food? Doing a Thanksgiving's worth of dishes most nights. It is what it is, I suppose. I try and make things easier on myself and double recipes to eat late in the week as much as I can. Eventually, I'll earn a cheat day...but for now I am pretty stoked: I can see the weight loss in my hips, stomach and in my face. More importantly, I feel a thousand times better. No more food hangovers or huge sugar crashes, and my anxiety is a now a blip on my Crazy Radar. That alone is worth any feeling of deprivation I might have.